This article is about the island chain. For the boat cockpit cover, see Bimini top. For the underwater rock formation, see Bimini Road. Because Bimini is close to Miami, Florida, many American anglers go to the islands by boat to fish or to enjoy the local nightlife. Scuba diving and snorkeling are also popular activities, as there are many shipwrecks in the area, such as the wreck of the SS Sapona, which ran aground in 1926 during a hurricane. The top of the ship is exposed to the air while the bottom half is submerged. Parts of the wreck were stripped over the years and some of the wood was used in the construction of the Compleat Angler Hotel and bar on North Bimini. 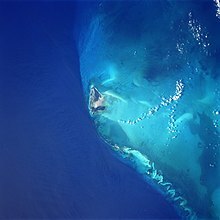 In May 2008 marine conservationist Jean-Michel Cousteau criticized Bimini Bay Resort, now Resorts World Bimini by Hilton, calling it a "catastrophe" and announcing, "allowing Bimini Bay to continue with phase II would certainly strip this island paradise of its precious natural riches. Over time, visitors and residents alike will suffer the decline of economic, social and environmental prosperity." ^ "I took a good-size snort out of that big bottle [of furniture polish] in the middle....Have you none of the clear McCoy handy around the house? ", The Mavens’ Word of the Day: real McCoy cites Dictionary of Americanisms, which gives the citation for this quote as Davenport, Butte Beneath X-Ray. ^ Lush, Tamara. "Crash of an Icon." Miami New Times. March 21, 2007. 2. Retrieved on January 27, 2009. ^ "Crack found in doomed plane's wing." CNN. December 21, 2005. Retrieved on January 27, 2009. ^ "Crash devastated Bahamian islands." CNN. Wednesday December 20, 2005. Retrieved on January 27, 2009. ^ Peck, Douglas T. "Misconceptions and Myths Related to the Fountain of Youth and Juan Ponce de Leon's 1513 Exploration Voyage" (PDF). New World Explorers, Inc. Archived from the original (PDF) on 2008-04-09. Retrieved 2008-04-03. ^ Newman, SP; Handy, RD; Gruber, SH (5 January 2010). "Diet and prey preference of juvenile lemon sharks Negaprion brevirostris". Marine Ecology Progress Series. 398: 221–234. doi:10.3354/meps08334. ^ Warne, K. P. Let Them Eat Shrimp: The Tragic Disappearance of the Rainforests of the Sea. Island Press, 2011. ISBN 1597266833. Retrieved December 1, 2013. ^ Cramer, Richard Ben (1992). What It Takes. New York: Random House. p. 455. ISBN 0-394-56260-7. ^ Cramer, Richard Ben (1992). What It Takes. New York: Random House. p. 437. ISBN 0-394-56260-7. Curran, H. Allen; White, Brian (2005). Terrestrial and shallow marine geology of the Bahamas and Bermuda. Special Paper no. 300. Boulder: Geological Society of America. ISBN 0-8137-2300-0. Jennings, D.; Gruber, S. H.; Franks, B.; Kessel, S.; Robertson, A. (2008). "Effects of large-scale anthropogenic development on juvenile lemon shark ( Negaprion brevirostris ) populations of Bimini, Bahamas". Environmental Biology of Fishes. 83 (4): 369–377. doi:10.1007/s10641-008-9357-3. Retrieved 28 August 2011. Kresge, Dave (2005). VantagePoint Guide to Bimini. VantagePoint Guides. ISBN 0-9729589-1-6. Saunders, Ashley (2000). History of Bimini. vol I (Rev ed.). Alice Town, Bimini, Bahamas: New World Press. ISBN 978-0-8082-9219-7. Shinn, E.A. (2009). "The mystique of beachrock" (PDF). International Association of Sedimentologists. 41: 19–28. Archived from the original (PDF) on 26 October 2009. Retrieved 28 August 2011. Swart, Peter Koenraad; Gregor P. Eberli; Judith A. McKenzie (2009). "Special publication of the International Association of Sedimentologists, 41". Perspectives in carbonate geology. Oxford: Wiley-Blackwell. pp. 19–28. ISBN 978-1-4051-9380-1. Zink, David (1978). The Stones of Atlantis. Englewood Cliffs, N.J.: Prentice Hall Trade. ISBN 0-13-846923-7. Wikivoyage has a travel guide for Bimini. "The Fountain of Youth". The Official Site of The Bahamas.